When visiting the owners of cats, there is much to be said for bringing a little present for them. 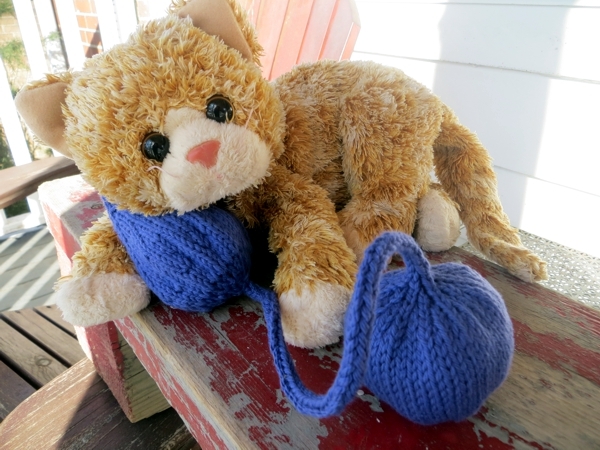 The cats, I mean, because there are some seriously cute cat toy patterns on Ravelry. My own stand-in cat, Molly, tested out the end result at length for today's post so - thank you, Molly. 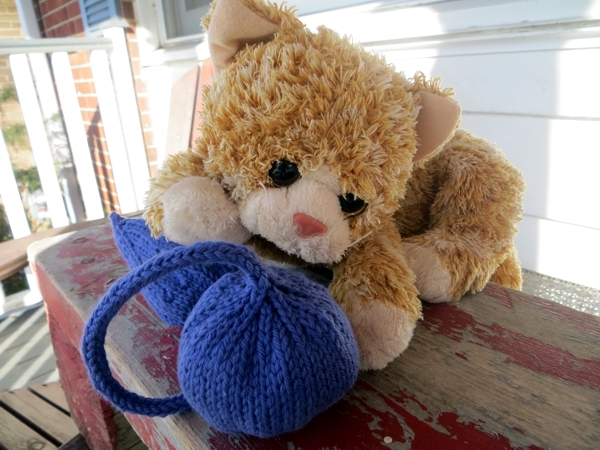 I knit this pattern in a dishcloth-weight purple cotton: it's Sheila Ralston's Under Door Two-Cat Toy, which was published at Fun Things To Do While You're Waiting. (incidentally, that is a really fun blog you will want to check out if you're a crafty person.) The idea is that you slide the I-cord under a door, then let the cats try to pull one end toward them from either side of that door. As one pulls, the other watches his/her prey get away, and the game gets very interesting indeed. 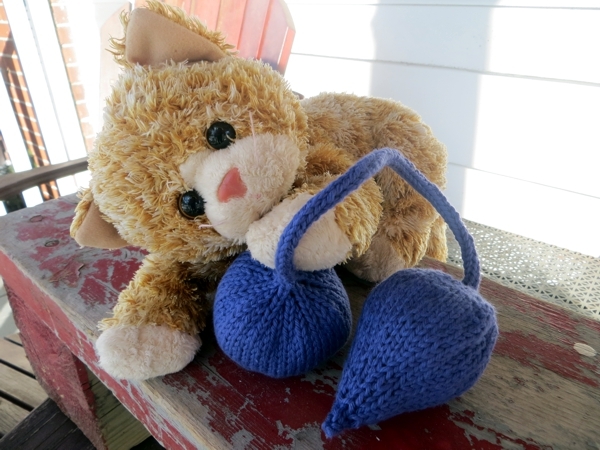 Sheila's pattern is super simple and cute, but I cast on the day before I was traveling - which means no time for extras like stitching up knits - and I couldn't find my vast collection of jingly bells to stuff inside, so I adapted it a bit. First up, I knit in the round instead of flat, so as to save time on seaming. 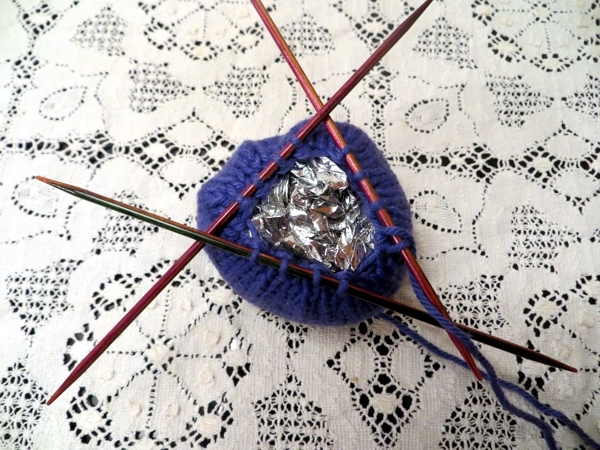 That made life so much easier, because I could stuff the ball as I went along and then knit the closure. 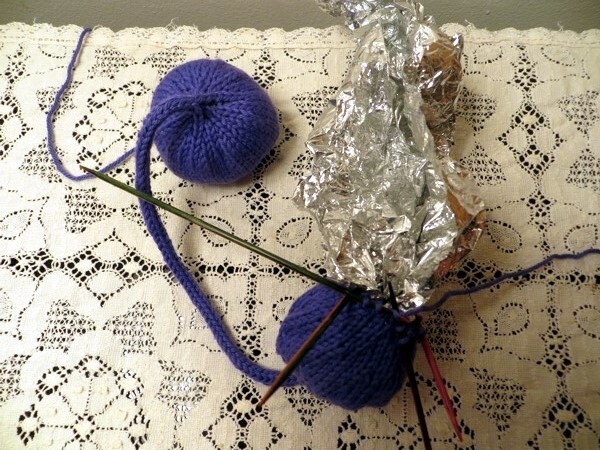 The I-cord that connects the two balls holds the stuffing inside at one end, and the cast on and cast off holds it in at the other. Owing to the lack of jingly bells, I decided to use a strip cut from an emergency blanket I had handy. These silvery sheets, available at any hardware/camping type store and I think dollar stores too, are inexpensive, super compact, and popular with runners at the end of a race or marathon. They also make a krinkly noise like tissue paper. Perfect for a pouncy cat. 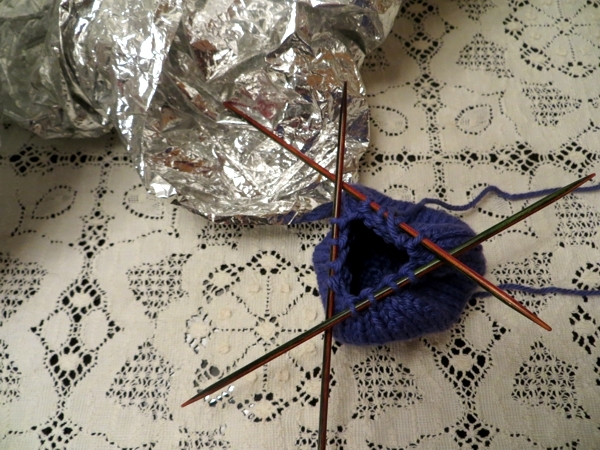 ... and when it was all set, I just knit onward and closed off the ball. Later, I sort of squeezed and squished the ball to get the blanket stretched out into the corners so it would look round, though the end result is more like a garlic bulb. 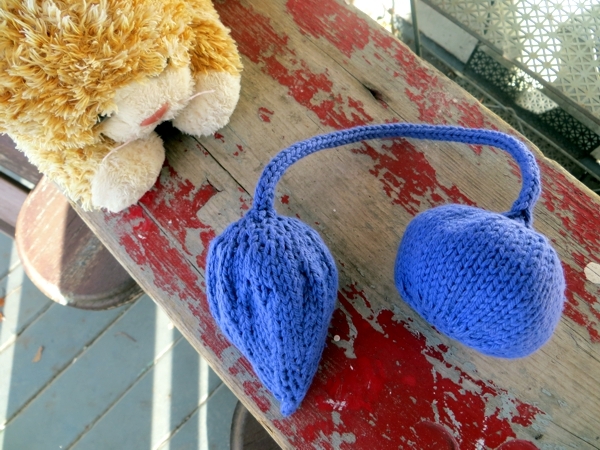 Then it was I-cord time, and when that was done I thought maybe I would make the other half into a strawberry shape because I was running out of yarn and knew I'd changed the first ball enough from the pattern that I'd never get the second one to look the same anyway. To make the change, I just decreased fewer stitches per round and put more rounds in between the decrease ones. 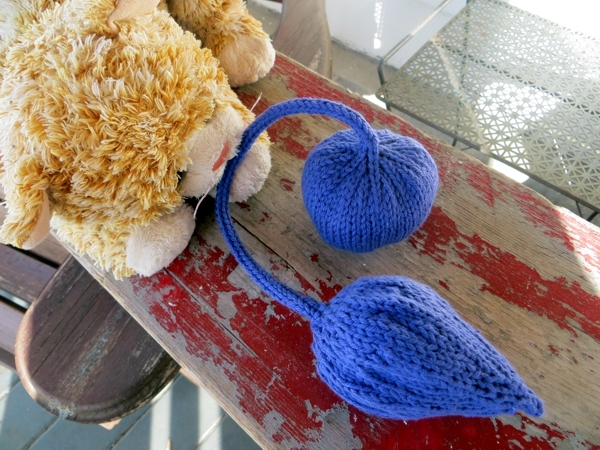 You can improvise this pattern pretty completely and still get a good cat toy, I found. To run in the ends since I couldn't get at the inside any more, I duplicate stitched a few knit stitches, then ran the needle up through the inside to the other half of the ball, and without pulling too tightly beforehand, I did some more duplicate stitches near the edge of the I-cord. That makes a very solid finish that you really can't see. and she was very nice about letting me take it back so I could give it to some real-live fellow kitties, even if she was a bit surprised when I suggested that. Tomorrow, I've got another Very Special finished knit to show you, so I hope you can drop in again. Have a great rest of the day in the meantime!